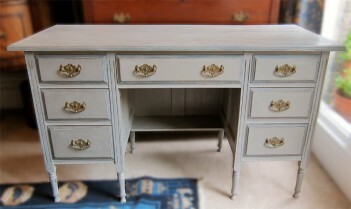 This is an Edwardian (circa 1910-1920) walnut desk, which we have painted using Annie Sloan paint in French Linen (taupe grey colour) and then picked out the detail in a thin coat of Graphite (dark grey). We have then sanded the piece to distress it, waxed and buffed to create a soft smooth sheen that it protective and tactile. All the handles are original to the piece. 127.5cm wide, 53cm deep and 74.5cm high. The inset for a chair is 57.5 cm high from the floor. Collection only or free local delivery.